This year we were delighted when Freddie and Joey decided they wanted to start writing a blog. Their perspective on our life and business has been invaluable! We hope that you have enjoyed them and before he went to the Bridge, Joey was able to collaborate with Freddie one last time. 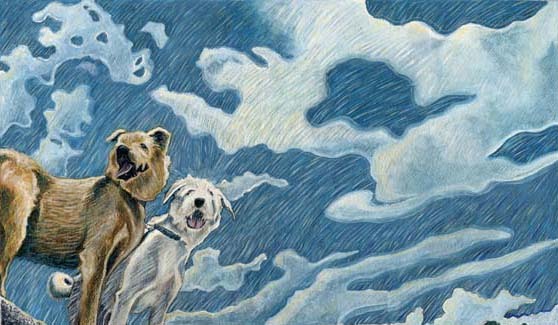 In this last blog, Jimmydog’s Chief Canine Officers Freddie and Joey take a moment to explain to their dog and cat friends why they should be immortalized in a custom portrait. And they know just the guy to paint it! Once again, we’d like to speak directly to the dogs—and also the cats—in our audience. We’ll give you wonderful people a moment to fetch your beloved pets and put them in front of the screen. Then you can step away while the four-legged folk talk for a few minutes. May we recommend you use this time to fix your pets a tasty snack? We bet your people take tons of photos of you on that phone thing they carry around and check obsessively. They can’t help themselves. You are so cute, so entertaining. But, really, don’t you deserve more than a photo stored on a phone? Sure you do. You deserve more. Friends, you deserve to be immortalized in a portrait—a custom painted portrait. A portrait captures not only your physical splendor but also your unique spirit. All the best people have their portraits painted—presidents, queens, even comedian Stephen Colbert. And we happen to know the perfect person to paint yours. Our person Todd Belcher is an amazing artist who devotes his time and talent to painting custom portraits. He paints all sorts of subjects, but dogs and cats are among his very favorites. He’s painted several portraits of us over the years and, not to brag, we look great in them. The best part is that you don’t have to do anything—there’s no going to his studio and sitting for hours while he gets the color of your fur just right. (What busy pet has time for that?) Todd paints portraits from photos and, as we talked about earlier, we know your people have taken plenty of you already. Portraits of presidents and queens often hang in public galleries and museums (Colbert displayed his on the set of his “Colbert Report” TV show). But the portraits Todd paints are so good that people want to keep them close, hanging them in their own houses. They look great in living rooms, dens, home offices and even bedrooms. Your people can choose the size of the portrait, whether they want you captured in colorful acrylics or classic black-and-white pencil, and even pick the background. Our other excellent person, Stephanie Belcher, will work with your pet parents to answer all their questions and get the portrait scheduled. She’s very nice and helpful. So, here’s the plan. Before you run off to finish your bone project or curl up for a nap, use your paw to click on this link. It will take you right to Jimmydog’s “How to Commission Your Custom Portrait” page. Now, invite your people back to the computer and tell them you have something really important to show them.